Last year I accompanied a friend of mine to Florida for a week in January. The temperature reached the mid 70’s and we celebrated the new year laying on the beach watching fireworks. My arrival home was more of a shock to the system. When we landed in Columbus, Ohio it was snowing and there was about 3″ on the ground already. I seriously considered going back to Florida this year, but it wasn’t in the cards. Instead of a trip south a couple of friends and I opted for a winter workshop, hosted by Mountaineer Photo Excursions (http://www.mountaineerphotoexcursions.com/workshops) in Oakland, Maryland and Deep Creek Lake. 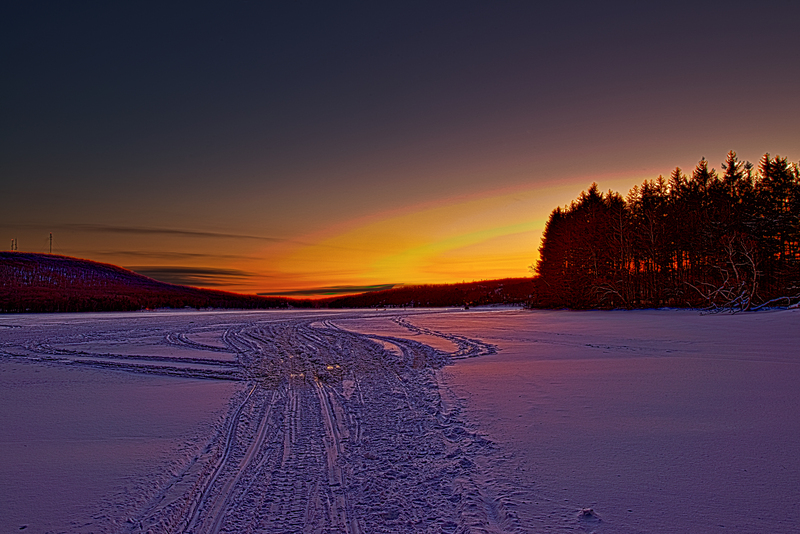 We wake up our first morning to catch the sunrise on Deep Creek Lake and it is 3 degrees and 30MPH winds (which is typical). We dressed, layer after layer of clothing and a ski suit, boots, gloves, hats that we could barely move about! We were sweating before we even left our room! The sunrise was lovely, but we soon found out that our key remotes to our cars no longer functioned and our autofocus and remote shutter releases were useless. 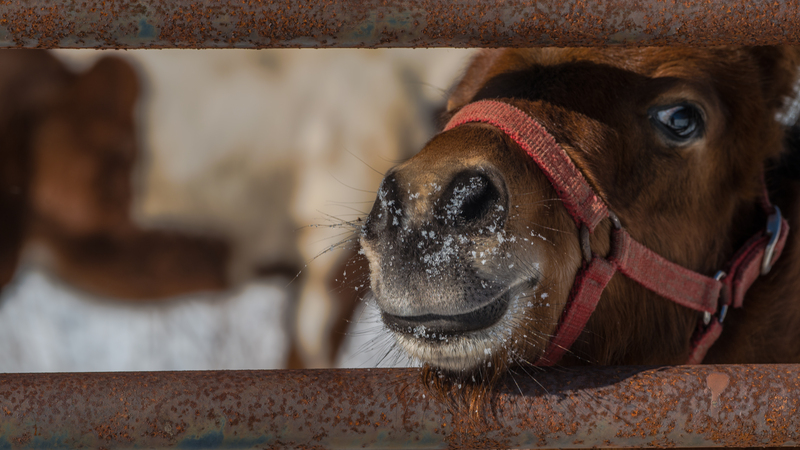 A few of us found out the hard way that you cannot blow on your lens or LED screens to get rid of snow or any other debris…it freezes instantly! After we had breakfast we, again, faced the cold blast of the lake; this time to watch the ice fishermen. We trudged out to the closest group we could find. 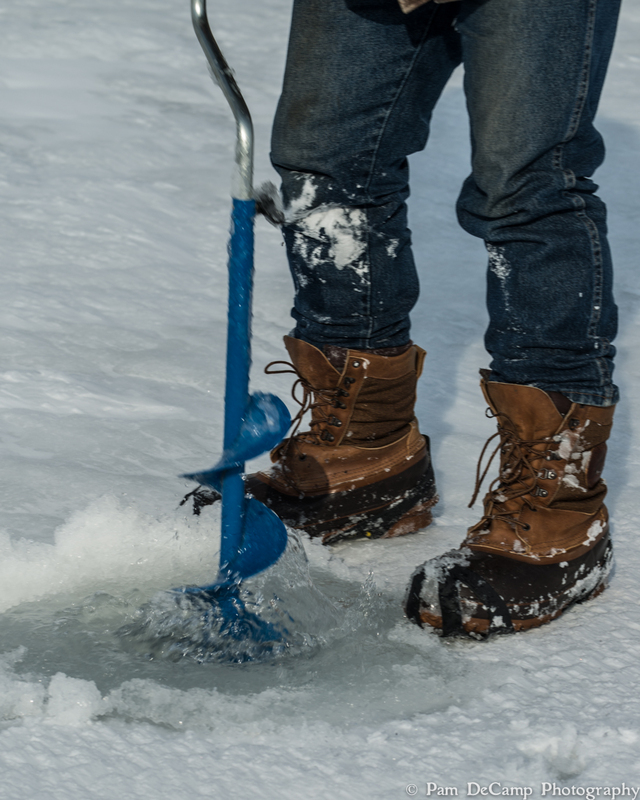 They used either a manual or motorized auger to drill a hole (no larger than 8″ in diameter) in the ice over the lake. 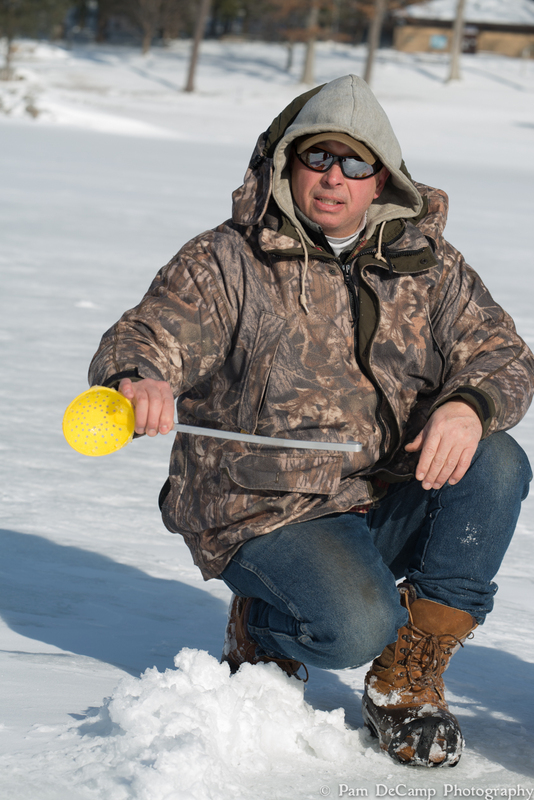 Measuring the thickness of the ice. 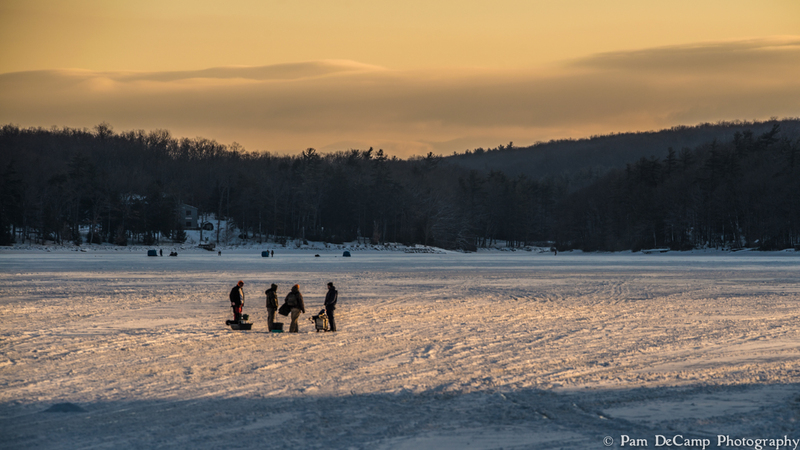 One fisherman told us the ice was about a foot thick beneath us…still…we were standing in the middle of a lake! 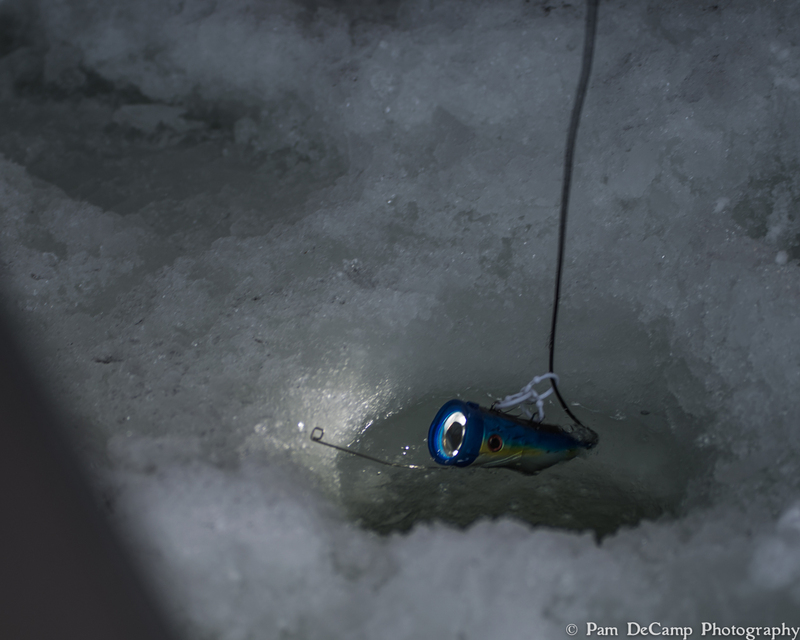 We found out later that there are many springs that feed the lake and the ice may not be as stable as we think it is! That was comforting to know…after we had made our way back to shore! They are not permitted to build “fish huts” but instead they have tents. Another fisherman showed us how he used digital technology by submerging a small camera into the water to find fish. Inside the tent it was very comfortable; he had a kerosene heater and a chair. 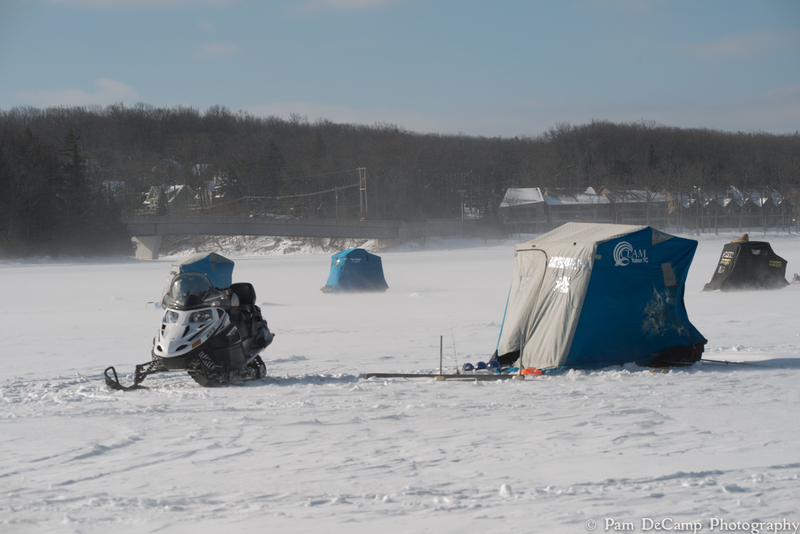 Many of the fishermen pull their equipment out onto the lake on little sleds; others ride snowmobiles out. 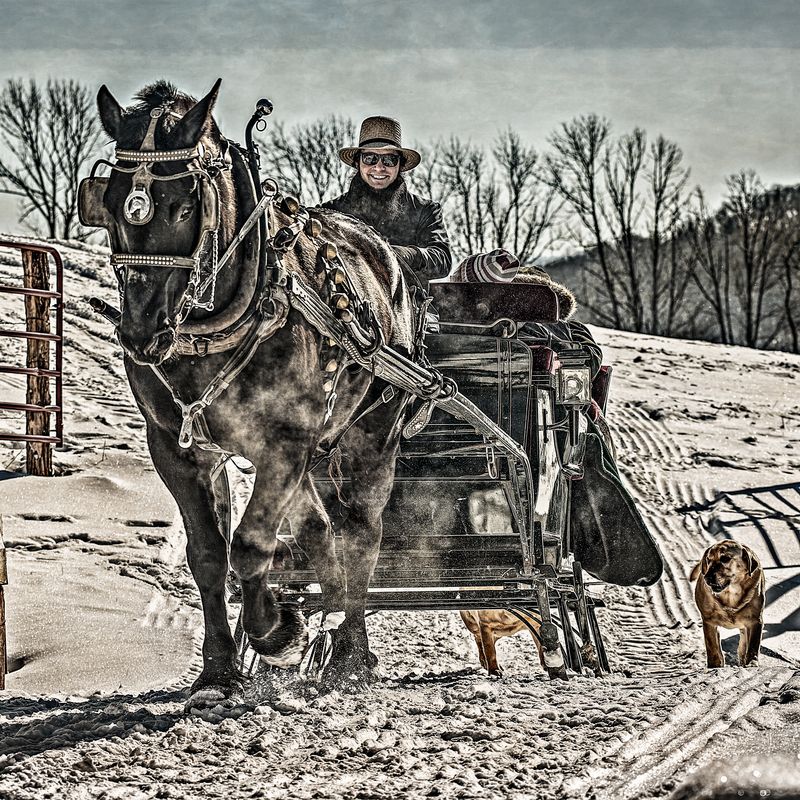 Out next stop was to the Circle R Ranch to see a horse drawn sleigh. The ranch was Amish run and we asked if we could photograph them and they had no problem with us taking pictures of them or their ranch. 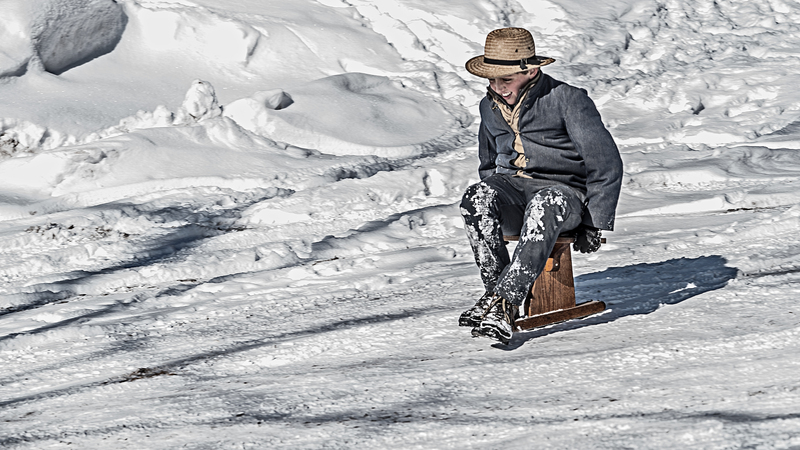 The kids had just been given a small handmade sled. It was the kind you had to balance yourself on and sit upright. The kids had a blast riding on the sled. They would start at the top of the driveway and go all the way to the end. The horses were very curious and would nudge us for attention. 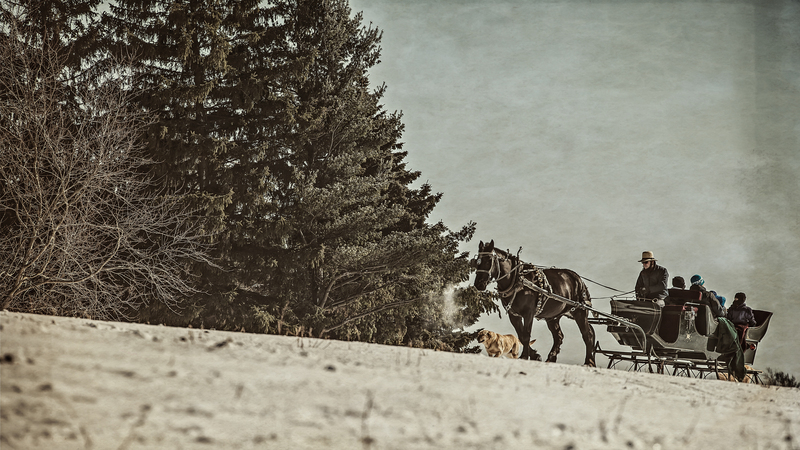 Just watching the sleigh coming over the hill was like the Currier & Ives Paintings I remember from the tins of cookies we received at Christmas. After a much needed “warm-up” and a bite to eat; the group made it’s way to the Swallow Falls State Park. 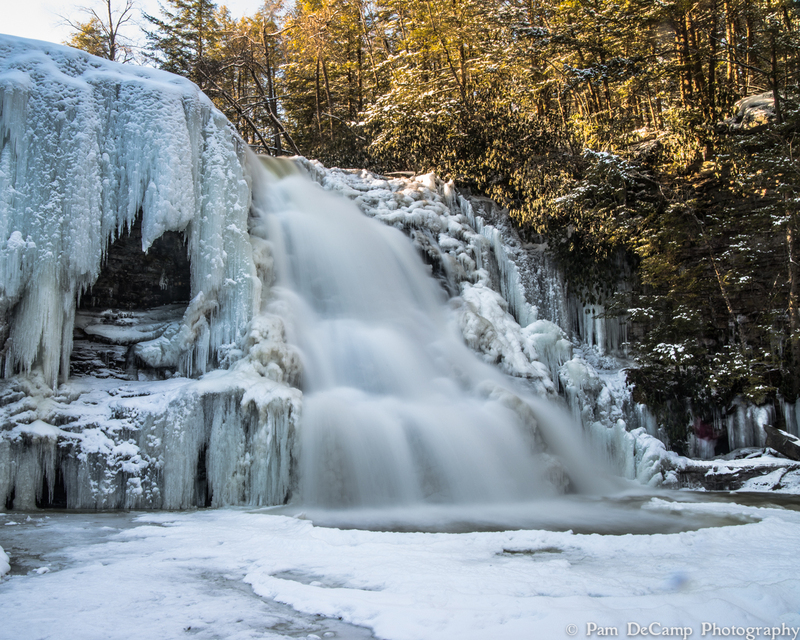 The falls were partially frozen, but there was enough water flow to capture the silky cascades rolling over the rocks. The stairs down to the falls were frozen and treacherous, but we all made it down safely. There were families hiking and the kids would sit on their bottoms and slide down the steps! That was fun to watch, but I’m not that adventurous! Do you think I had enough of the cold? Apparently not! 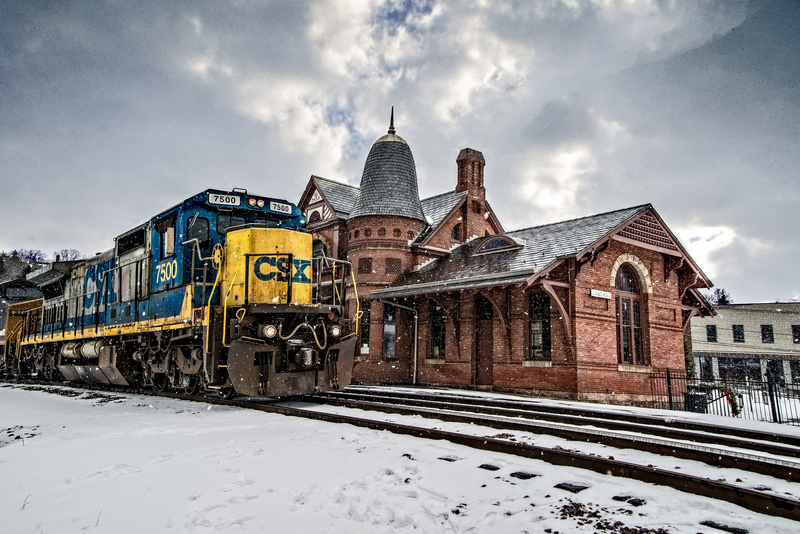 This past weekend I ventured up to northern Ohio; the Cleveland area. I did have a purpose for going, though. I had been given information on a repair shop that serviced my brand of video camera. 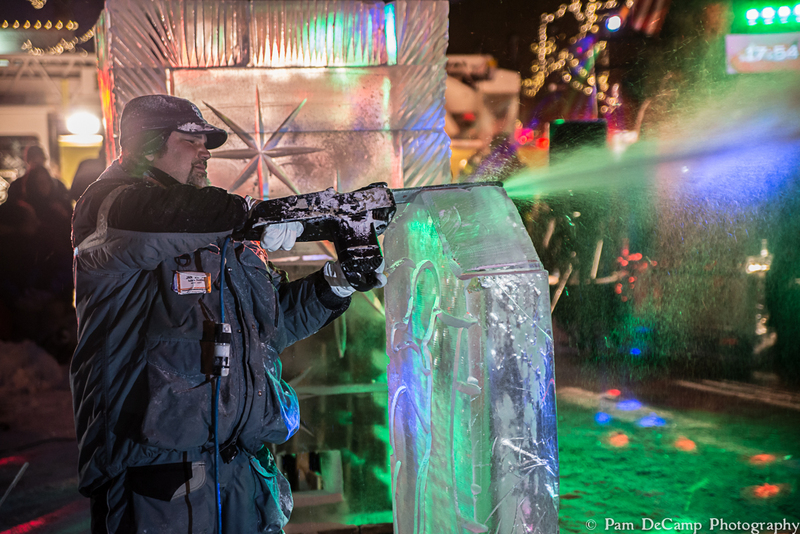 I chose this particular weekend because Medina, Ohio has an Ice Festival. 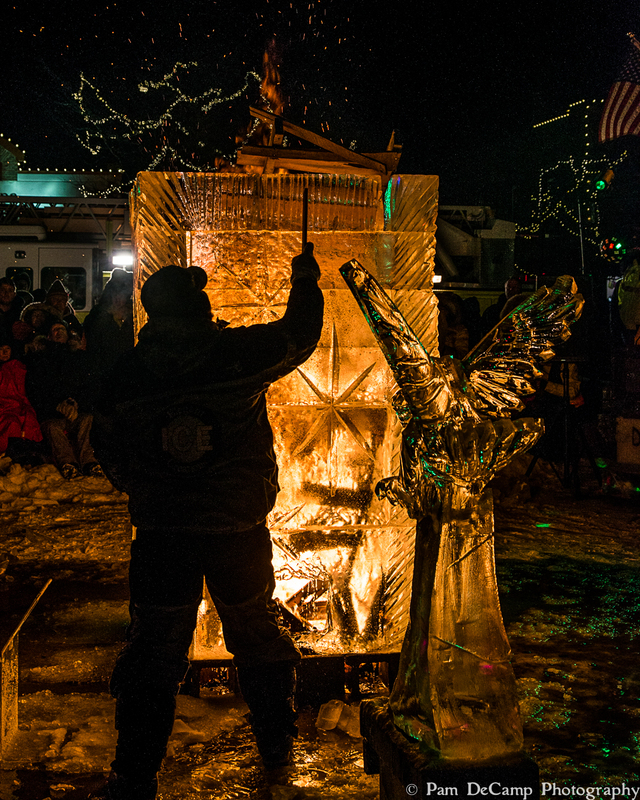 Professional ice carvers come from all over to compete in competitions and to show off their craftsmanship. There was already a foot of snow on the ground and it was COLD! Friday (February 13, 2015) was the opening of the event. 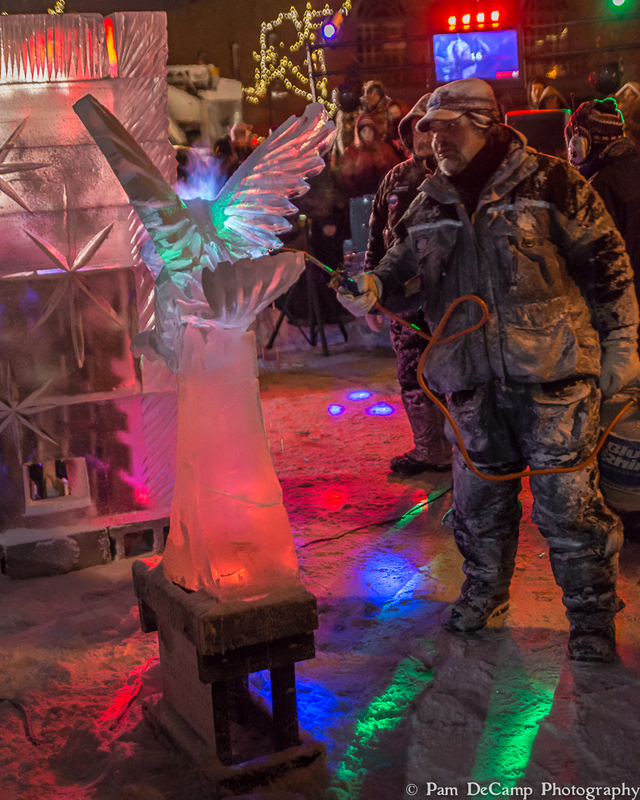 They have a speed carving competition where the participants are given 20 minutes to create a finished ice sculpture. 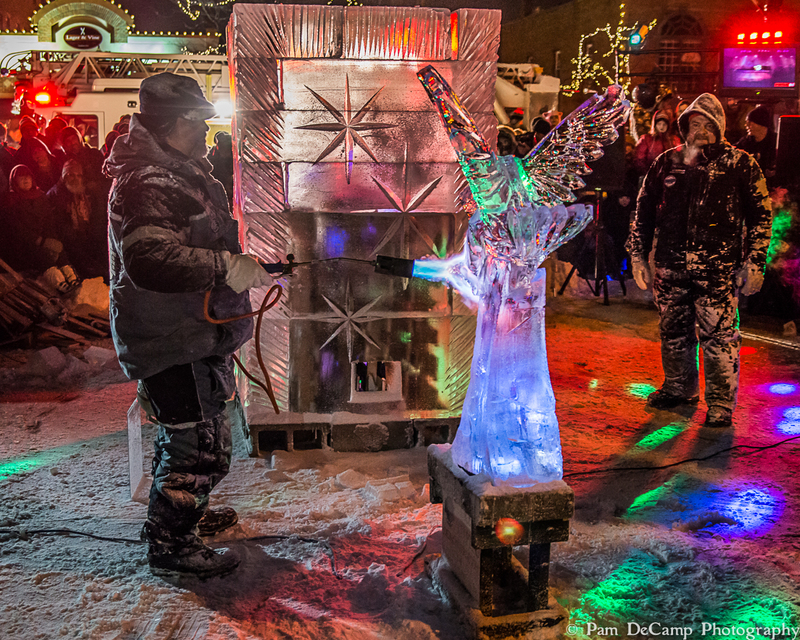 Think about it…20 minutes to carve a sculpture out of a block of ice that is about 4′ x 1′ (estimated) and weighs over 200 pounds! There were several pieces on display around the town square, but I wanted to see the ice carving! The competitors were given 2 tools, a chain saw and a die grinder, and those were the only tools they could use for this competition. It was fascinating to watch how they outlined their pattern with the grinder and then they started cutting out sections with the chain saw. The would remove large sections, which later they would fuse back on to their design as horns, wings or fins, depending on what their final creation was going to be. 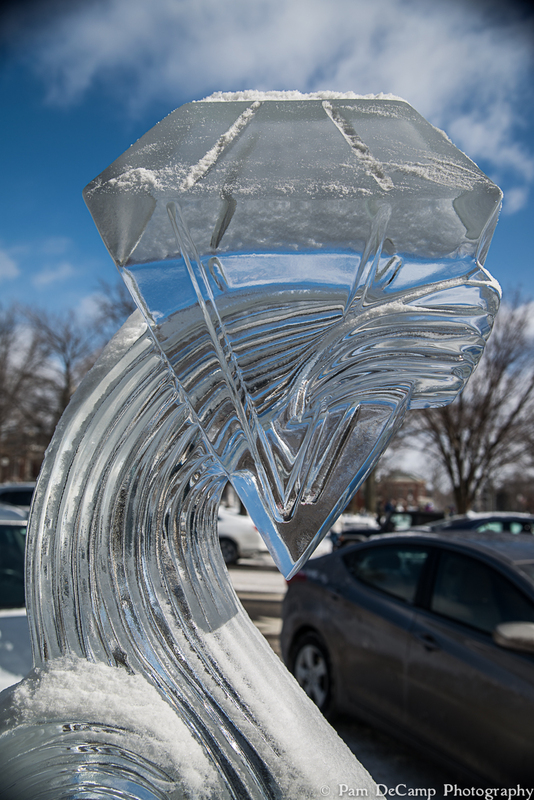 The winner of the competition was Aaron Costic of Elegant Ice Creations in Broadview Heights, Ohio (http://www.elegantice.com). I overheard him telling someone how they add color to the sculptures. They mix up jello and put it in the mold then seal it in with water on the back side of it. It sets up quick when its added to ice.Mr. Costic has an impressive resume on the website. 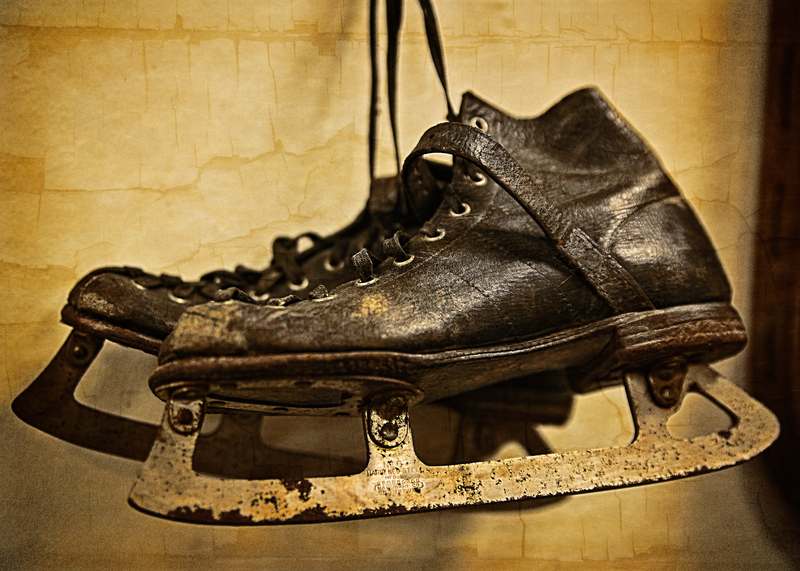 He has been in several national (both as a participant and a judge) and world championships as a participant. He has also participated in the Olympics; in 1998 he won a bronze medal; in 2002 he finished fourth; and in 2006 he won gold! I had the opportunity to speak with Mr. Costic briefly before I left Medina on Sunday. He is very soft spoken and is easy to talk to. 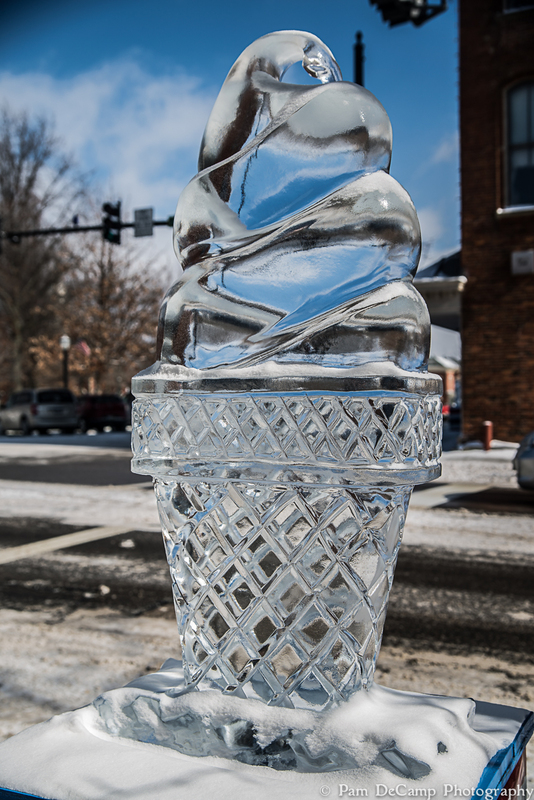 Medina Historic Square is lined with ice sculptures sponsored by various businesses. 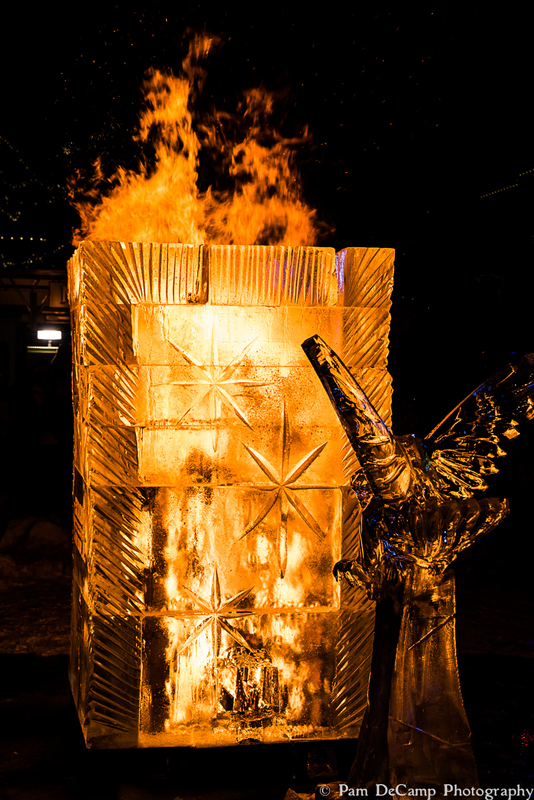 The highlight on Friday evening is the lighting of the Fire and Ice Tower. It is about a 12′ tower of ice with an opening in the middle. They stack the firewood in the middle of the tower and when it is lit, the fire glows beautifully through the ice. They allow it to burn until the ice puts the fire out. More wood is added to the fire. After the fire had reached its final glow, I decided it was time for me to head out. I walked around snapping a few more shots and I noticed a group of people congregated together talking. They had tripods and various camera equipment and I thought to myself, “A camera club.” I walked over and introduced myself to them and they were from the Erie Shores Photography Club. Mark Nowak, the president was talking about the event and they were deciding on a location for dinner. He turned and asked me, “Hey, do you want to join us?” The evening was great! I met fellow photographers who were out doing what photographers do best…braving the weather to get the picture! The members from Erie Shores were, Mark, Jay Allen Linder, Julie Mulheren, and Thomas Rak. We talked about different places we enjoyed shooting and talked about the upcoming Shoot the Hills at Hocking Hills. Their club has several members who attend the event. I look forward to running into them this year! Saturday morning greeted me with snow and subzero temperatures. I did venture out to meet up with my cousins for lunch. The drive over to Fairview Park was interesting especially on the snow covered interstate. I made it there and back without incident! I had a nice Valentine Day lunch with my cousins Ruth, Kenny, Bruce, and Wendy. Sunday I made my way home…only to be greeted Monday morning with a history making snow storm in our area! Why didn’t I go south this year?